These numbers reflect estimated student expenses for the 2018-2019 school year. Amounts will change slightly from year to year, but as the cost of college increases, the scholarship packages will correspondingly increase. Your official financial aid award will be included in a letter directly from Brown. Receiving outside funding and tuition benefits is an excellent way to help reduce your need to work and/or borrow student loans while at Brown. When you receive outside funding, the Office of Financial Aid will reevaluate your financial aid package and account for the additional resource. Federal and state grants will be applied to your financial aid package and will replace University Scholarship. If your outside funding exceeds the total of your summer earnings and campus employment, you may ask the donor or organization to defer your award to another academic year. Your university scholarship will be reduced if the total outside scholarships you receive exceeds your summer earnings and campus job. For more details on what is required of you in regard to outside funding, along with some examples, please visit our Frequently Asked Questions. Students may waive participation in the student health insurance program if they are covered under a parental or private plan that provides comparable coverage. If a QuestBridge College Match student is not covered under an insurance plan, he/she will be eligible for a Health Insurance Scholarship to cover this charge. Students’ financial aid awards may include an allowance for travel expenses. This allowance is an estimate and students’ actual expenses may be different than the amount of the allowance. Students are not required to submit receipts or any documentation to the Office of Financial Aid to substantiate their actual expenses. However, if a student would like to explore the option of borrowing student loan funds to cover expenses that exceed the standard allowance, documentation must be provided. Originally reported application figures will be confirmed prior to an initial award being offered. Students must reapply each year for financial aid in order to confirm eligibility and maintain the match scholarship award. Renewal forms and procedures are distributed by the end of the fall term. The figures listed for cost of attendance, summer earnings and work-study amounts are based on the 2018-2019 academic year. Costs for 2019-2020 are not yet available. Your annual cost of attendance includes an allowance for books and personal expenses. A travel allowance may also be included and will vary based on your home address. Students may choose to replace their student employment expectation or their summer earnings contribution with a student loan. Students are expected to contribute 20% of their savings annually toward their college expenses. 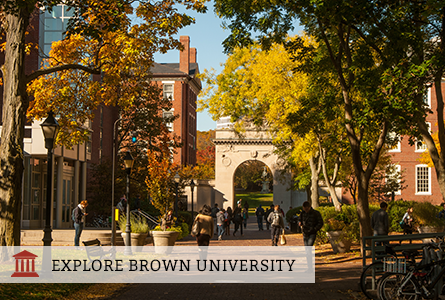 Brown University has a long history of providing educational opportunities to talented students of all backgrounds, and is strongly committed to partnering with families to make a Brown education affordable. Financial need is evaluated by reviewing financial aid application materials and family circumstances. Factors such as total family income, household size, and the cost of other household members in college are taken into account. A family's assets (savings, investments, real estate) may also be considered. Families with parent total income less than $60,000 and assets less than $100,000 will not be expected to make a parent contribution toward the cost of education. Students will have an expected contribution from summer work as well as a campus employment opportunity during the school year. Because these are factored in as resources towards the cost of attendance, all costs will not be covered by scholarship funds. The Scholarship Details above provide the breakdown of costs and funding. Brown University meets 100% of a family's demonstrated need as determined by the Office of Financial Aid. Families with parent total income less than $60,000 and assets less than $100,000 will not have an expected parent contribution toward the cost of education. Use Brown's Net Price Calculator to estimate the financial aid for which you are eligible.